Think about luxurious stay at a hotel with its own private beach and spa treatment, and the all-inclusive 5 star Amwaj Oyoun Resort & Spa comes across as an inherent choice. With its opulent rooms and suites, the hotel provides top-of-the-line amenities to keep you pampered for a lovely holiday. 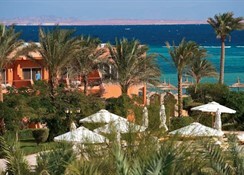 What’s more, the breath-taking view of the Red sea and about 600 metres wide sandy beach are great for a relaxing holiday for you as well as your family. The Main Building and the Annex Building house the rooms for accommodation. You have choice to pick from 465 rooms & suites- 274 Superior rooms, 18 Family Large rooms, 12 Executive Suites and 161 Standard rooms. The standard rooms in the Annex Building have a fairly spacious size of 32sqm each and they offer a pleasant view of garden or pool from attached terrace/balcony. 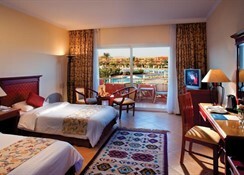 The Superior rooms in the main building are of similar size but provide added comfort. 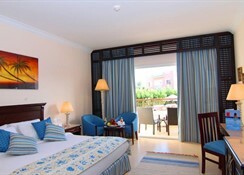 Family rooms are larger at 40sqm and have superior amenities tailored for families. You get a lovely view of the garden landscape from these rooms. And if you prefer the top-of-the-line of luxury and niceties, simply pick up an Executive Suite spreading over 54sqm and includes a master bedroom as well as a separate living area. The living room has an attached terrace that looks over either the sea or pool or the landscaped gardens. All the rooms feature king-size beds or twin beds for improved functionality. The rooms are air-conditioned and have general amenities such as a satellite LCD TV, direct dial international telephone line, in-room safe deposit box and a minibar. They also have a bathroom with bathtub each. Most of the rooms are connected to offer a practical accommodation solution to families or guests in groups. Go adventurous with your taste buds at the Amwaj Oyoun Resort which offers a wide range of delicacies from the Far East to the South West. The restaurants claim to provide authentic dishes prepared by chefs who have come from premium restaurants all over the world. Oyoun Restaurant in the main building offers an enchanting view of the sea and offers both national and international cuisines. The restaurant opens for breakfast, lunch as well as dinner. You will be glad to find daily themed buffets here. 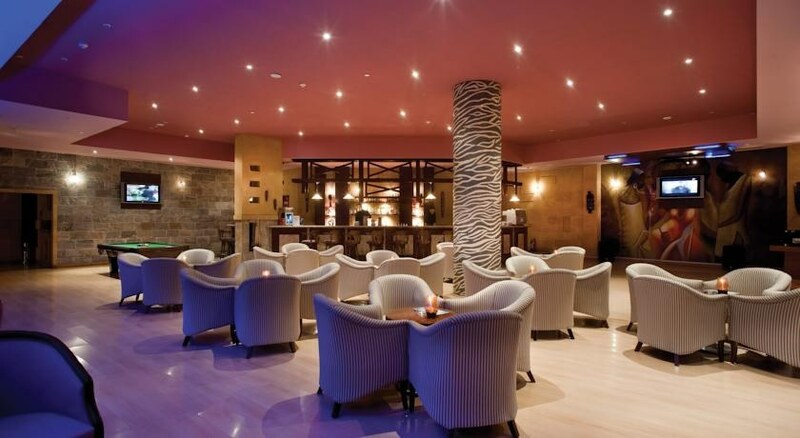 The resort has a host of other restaurants such as The Terrace Restaurant which is known for pre-reserve international buffet available with extra charge, Primi Piatti Italian Restaurant for pre-reserve à la Carte Primi Piatti, and Blue line Fish Restaurant for sea food cuisine buffet. Poolside Open Air BBQ Restaurant is a pre-reserve restaurant by the pool area and serves light lunch, snacks and set menu dinner. 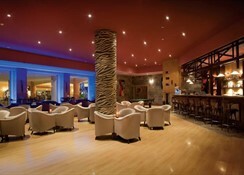 You can have cocktails and beverages at Soweto Bar which is a sea view lobby bar in the main building. There is also a Beach Bar on the beach, which serves drinks and beverages. 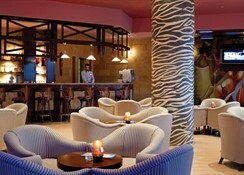 Other bars around the resort are Halfway Hut Pool Bar, Waterfalls Sunken Bar and the Atrium Bar. Holidaying becomes more relaxing when you treat yourself with some Spa services available here. There are different massage packages to help rejuvenate your body. You can enjoy yourself being carefully blended with essential oils and sea salts at the Oyoun Spa target zones, to help remove dead skin cells from your body leaving a silky smooth skin. There are other amenities such as steam bath, sauna and Jacuzzi to enjoy a great day at the resort. 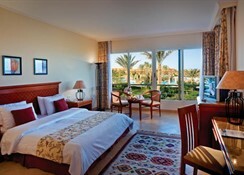 The Amwaj Oyoun Resort is a great place for lots of activities as well. You can enjoy beach volley ball or have a Mini Football playground at the beach, thanks to the private sandy beach of the resort. There is an Aqua-Park for adults and another for children too. Water Polo would be a great fun idea for groups and families. You can enjoy at any of the 3 swimming pools, a heated pool and an activity pool. Free sun-beds and towels are available to the guests. There are 2 swimming pools for children. Among other sports and activity options available include Billiards, Table Tennis and a flood-lit tennis court (lighting is chargeable). You don’t have to skip your fitness workouts thanks to the aerobics studio and a fully equipped gym. There is an amphitheatre and the resort entertains its guests with daily shows by night.